To the cloud promised land! Many of our enterprise customers want to move some of their applications to the cloud. They’re doing this for well-established reasons, such as: reducing datacenter costs; having more agile development; making it easier to scale applications up and down; and importantly, to access cloud-native services like Google Dataflow or Azure Database Services that can help them become more agile. But how do you tie it all together? As they consider the cloud, however, enterprises have to consider how it will fit into their overall application architecture and what kind of advanced event broker will best suit their needs. The need for modern event brokers is becoming even more important now as more systems must become near-real-time rather than batch for decoupling to be more agile and for improved system robustness and scale across hybrid environments. Any of these scenarios rules out adopting the simple services from the public cloud providers, which only offer very basic queuing or pub/sub capabilities and don’t support multi- or hybrid cloud deployments. Another possibility is to take enterprise event broker technology and deploy it using in-house resources into a virtual private cloud environment. This provides the eventing features and functions your applications need, but you have to engineer, deploy, cluster, upgrade, patch, secure and monitor it yourself – potentially across multiple clouds (which removes a lot of the benefits of moving to the cloud in the first place). There are also third-party broker services offered in the various clouds, but those often don’t offer hybrid- or multi-cloud deployment options and can’t be deployed within a VPC, so they don’t offer the privacy and control many enterprises need. We’ve now enhanced PubSub+ Cloud, our enterprise-grade event-broker offered as a service, to make it available inside your virtual private cloud environments in AWS, GCP and Azure. This gives you the best of both worlds: the benefits of an enterprise-grade event broker SaaS with the security and control of a private network. You can use PubSub+ for all your eventing and messaging needs to quickly and easily build all kinds of applications—from microservices and IoT to data aggregation for analytics. PubSub+ Cloud gives you world-class performance, scale and reliability to support all kinds of event-driven applications and, most importantly, the ability to run event broker services in all your clouds while easily connecting them together into an event mesh to dynamically share events anywhere in your enterprise (and without having to set up or maintain the event brokers yourself). It also gives you all the security and control you need, including complete control over encryption keys for data at rest, TLS certificates for data in motion, and identity and access management. It’s just as if you had deployed the brokers yourself, except that PubSub+ Cloud does it all for you. You’ll find PubSub+ Cloud really easy to use. The management console lets you quickly spin up new services with varying capacities depending on what you need, in any region of any cloud, and use them individually or connect them together into an event mesh. You can also include Solace event brokers and appliances deployed on premises in a hybrid cloud event mesh. And you can use the console to easily perform administrative functions like adding or removing users, seeing how services are being used, purchasing additional plans, and more. And all our enterprise plans come with 24×7 Platinum support. If you’re moving to the cloud, PubSub+ Cloud makes your choice of how to provide eventing and messaging services for your applications an easy one. You could do it all yourself and engineer, deploy, manage, upgrade, cost-optimize, and secure your event brokers in multiple clouds – but that defeats many benefits of the cloud. Or you could leave it to the experts at Solace who will do it all for you so you can increase your agility and focus on delivering business value to your customers. For example, one customer who saw the benefits of the managed service approach using PubSub+ Cloud in their VPC is a global consumer packaged goods company. They’re using PubSub+ Cloud to connect to hundreds of external suppliers and they now seamlessly exchange hundreds of thousands of events each day. 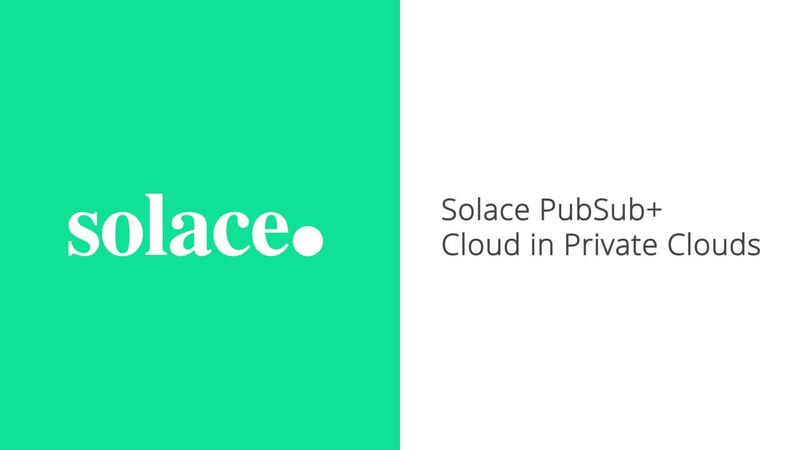 So if you’re moving to the cloud, becoming event-driven, and want the benefits of a SaaS combined with the security and control of a private deployment, check out PubSub+ Cloud – you’ll be happy you did. Shawn McAllister is Solace's Chief Technology Officer, responsible for deepening Solace’s understanding of requirements and use cases across industries and organizations, evangelizing our unique approach and solutions, and working closely with our customers to identify ways of improving our technology and value proposition. Prior to joining Solace, Shawn led software, hardware, and test engineering teams at Newbridge Networks (later Alcatel Canada), where he was responsible for the development of features on ATM and Ethernet switches as well as the 7750 Multiservice IP Router. Mr McAllister was a regular attendee and contributor to the ATM Forum and co-inventor of several patents in the telecommunications space.